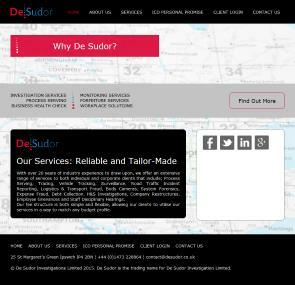 De Sudor are a leading provider of a range of specialist services to both individual and corporate clients. These services include Process Serving, Tracing of persons and/or assets, Vehicle Tracking, Surveillance, Road Traffic Incident Reporting, Logistics & Transport Fraud, Body Cameras, System Forensics, Expense Fraud, Debt Collection, Health & Safety Investigations, Company Restructuring, Employee Grievances and Staff Disciplinary Hearings. We offer a friendly, discreet, affordable and highly effective Private Investigation service. De Sudor Investigations takes confidentiality seriously and has signed up to the ICO Personal Information Promise and appear on the list of signatories at the Information Commissioners Office website. Based in Suffolk, with agents across the UK, we offer individuals and businesses of all sizes private investigation services delivered to exceptionally high standards. De Sudor Investigations offers professional and reliable services to our private and commercial clients. Do you suspect your partner is not being as faithful and honest as you, or a business associate might be trying to defraud you, or perhaps someone you care about has started a habit that is going to be harmful to them. You need to be 100% certain before you take any action, but what if you are certain yet unable to prove it? Before you can confront someone with whom you have a relationship, whether in business or your personal life, you must have all of the facts. If all other options have been exhausted, or are not practical, discreet surveillance can be an effective way to find out what you need to know. All of our reports are accompanied by high quality photographic and video evidence when required. Road traffic accidents are often traumatic incidents and litigation arising as a result is becoming more common as court awards increase and injured parties become more aware of the compensation that may be available to them. De Sudor Investigations has wide experience in this field relating not only to accidents involving cars, but also buses, heavy goods vehicles, farm equipment, motorcycles, bicycles and pedestrians. Here at De Sudor Investigations we are able to offer Tracing Services, Detailed Credit Information Reports tailored to your requirements. We specialise in the tracing of Tenants who have left addresses and the landlord with outstanding debts allowing the letting agency to pursue any outstanding monies or damage that needs to be settled. We provide information on individuals, limited companies and non limited companies. We aim to provide powerful search facilities giving you the information you need whilst ensuring that our service remains flexible and value for money. Logistic and transport businesses have seen a rapid growth in both fuel and tyre theft over the past 2 years and is estimated to be costing the industry £2.5b a year. Our team of experienced surveillance operatives can provide confirmation of this activity via photographic or video evidence. GPS vehicle tracking is the one of the most powerful tools for collecting evidence of whether your spouse, partner or employees are where they say they are. It is an extremely cost effective, quick and discreet way to find out where they are or who they are meeting. De Sudor Investigations has both male and female Process Servers who will act on your behalf serving legal documents & important papers, which must have guaranteed delivery. We serve outside of normal working hours and will always go to great lengths to serve the subject if they are being elusive or deliberately avoiding service. Based in Suffolk we operate throughout East Anglia.